Pete try to watch Auto Focus a film about Bob Crane (of Hogan's Hero fame) that I really like. Watch it at least 10 times since I got it and never got tired of watching this film. Greg Kinnear and Willem Dafoe (as always) give incredibles performance in this film. Thanks for the reminder Jimmy... I will try to get to that one this weekend... as it is one I been wanting to check out. And to think... I read that review at the time. This triumphant story was nominated for 9 Academy Awards®* – winning Oscars® for Robin Williams and hot newcomers Matt Damon and Ben Affleck. Will Hunting (Damon) is a headstrong, working-class genius. After one too many run-ins with the law, Will's last chance is a psychology professor (Williams). With Academy Award™ nominee* Minnie Driver (Grosse Pointe Blank) and Ben Affleck (Armageddon). Now you can experience this powerful and unforgettable movie like never before with the Miramax Collector's Series on DVD. 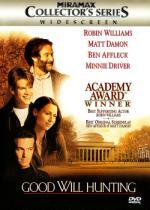 *1997 Best Picture, Best Actor – Matt Damon, Best Director – Gus Van Sant, Best Supporting Actor – Robin Williams, Best Supporting Actress – Minnie Driver, Best Original Screenplay – Ben Affleck & Matt Damon, Best Editing, Best Original Dramatic Score, Best Original Song. After all the people that recommended this one (on and off this site) I thought I should pop this one in next. My main concern in this movie is that it is Robin Williams... but in a drama? I believe I remember seeing him in another drama and enjoyed him in it... but was that a fluke? But I must say after watching this movie it was no fluke! He was just fantastic in this one... no way around it... he can act! Matt Damon is excellent in this one as well. This is a very good story that I enjoyed quite a bit. But I must admit that some scenes were a little slow for my taste. I know it is the kind of story it is... but there was a couple times I caught my attention slipping. Even so... the movie always pulled my attention back before too long. I liked Robin Williams in Patch Adams too. Have you seen it? Yup... seen that one several times. I consider that one to be a good mixture of both comedy and drama. Matter of fact that might be the one I was thinking for his other dramatic role I saw? When you mentioned drama, I thought of him in One Hour Photo. Could be... I seen that one too.. a long time ago. I guess I have him in more dramatic roles then I thought. Remember them? The Dad, Mom, and six kids that were The Brady Bunch, whose clean-cut but chaotic lives and hilarious domestic mayhem made them the most popular TV sitcom family of the 1970s? This fabulous new biopic, based on the memoirs of actor Barry Williams (Greg Brady), reveals the behind-the-scenes truth about what really happened: the legendary off-screen battles between Robert Reed (Mike Brady) and the show's real daddy, series creator Sherwood Schwartz; Barry's date with his screen Mom; his relationship with 'sister' Maureen McCormick (Marcia Brady) and the ultimate question - did they or didn't they? You'll laugh and cry along with them all as the meteoric rise to international TV stardom brings happiness and heartbreak in a moving story of what the rocky road to fame is really like. I bought this one more because I am a Kaley Cuoco fan then I am a Brady Bunch fan. It does seem I enjoy the series more now then I did when I was a kid... I know it is a very odd thing... I don't understand it myself. Maybe it is just a strong nostalgic thing. Anyway... in this TV movie Kaley Cuoco plays Maureen McCormick (Marcia Brady). This movie was made 10 years ago so she does look a bit younger in this one. After all going by imdb... Kaley was only 15 at the time of making this movie.. wow... that is my daughter's age. It was odd though... in some scenes I actually saw Maureen McCormick in her. But in other scenes all I could see is Kaley Cuoco. Was this one of those E! behind-the-scenes kind of documentaries? I didn't know Kaley was in this...I may have to get it now! And I've actually read the book this is based on though it's been several years. No... it is not a documentary at all... it is an actual movie about the making of The Brady Bunch... from the prospective of Barry Williams. Barry Williams has a part in the movie as himself in the beginning of the movie... and in the end of the movie. Plus he sort of narrates a bit during the middle of the movie as well. Another thing I thought was cool... but forgot to mention... Micheal Lookinland was played by his real life son... Scott Michael Lookingland. Also Michael had a small cameo appearance as a cameraman. Robin Williams can do more serious roles really well too. He's really good in Insomnia ...I need to watch that one again. And another Robin Williams drama that I have... but slipped my mind. For the first time ever you can enjoy this timeless classic in a Special Edition DVD. Fully restored to look and sound as it was originally intended, it also features hours of exclusive bonus materials your entire family will enjoy again and again. He's the star who provides the most laughs per gallon. He's Herbie, the lovable car with a mind of his own! Dean Jones, Michele Lee and Buddy Hackett join Herbie in this revved-up comedy classic. Jones plays down-on-his-luck race car driver Jim Douglas, who reluctantly teams up with the little machine. Douglas thinks his sudden winning streak is due to 'his' skill, not Herbie's. He finally realizes the car's worth when a sneaky rival plots to steal Herbie for himself. But it's Herbie who'll steal your heart in this wildly fun, rollercoaster ride of a movie you'll never forget! Cartoon: "Susie, The Little Blue Coupe"
This is the first time I seen this classic Disney movie since I was a kid. A movie I remembered really enjoying. While I still enjoyed it very much... it wasn't quite as good as I remembered. While there was definitely some laughs in this one... it wasn't as many as I was remembering. But there was also scenes and people I was remembering that wasn't in this movie... so I think what happen was that in my mind I was combining some.. if not all... the Herbie movies together. Which just makes me want to find the rest of the movies so I can see them again as well. For such an old movie... the special effects were done rather well. I mean after all... this movie is over 40 years old. Anyway... it was fun watching this movie again after all these years. And they really seemed to make a nice special edition release for it... though I haven't taken the time to check out the extras yet. "Blades of Glory is pure hilarity, a gold medal comedy winner"* starring comic superstar Will Ferrell (Talledega Nights) and Jon Heder (Napolean Dynamite). Bitter figure skating rivals Chazz Michael Michaels (Ferrell) and Jimmy MacElroy (Heder) brawl after tying for the gold medal at the world championships. Banned for life from men’s competition, these archrivals beat the system thanks to a loophole that allows them to skate again - in pairs competition! Co-starring Craig T. Nelson, Will Arnett, Amy Poehler and Jenna Fischer. I felt like something more on the silly side of things next. And I definitely got that. When it comes to Will Ferrell movies... Some I really enjoy... but others I just can't stand. This one is unfortunately far from a favorite. While it did have a little entertainment value in some scenes... for the most part I just couldn't get into this one. The very ending moment of this movie was so ridiculous in itself it made my score of the movie go down a bit. But hey... at least I did make it to that end moment. I was starting to wonder if I would while watching this one.